Being located in thick jungles and off from main-road; the Mayan ruins of Coba is not as popular as those of Tulum or Chichen Itza. But this remoteness has only added charm and serenity to this location. Tourists can walk free among the numerous ruins of the temples, pyramids, stele inscribed with Mayan hieroglyphs placed here and there under thatched sheds, and dilapidated structures; they can let their imaginations unleashed after those people who walked through these ‘sacbes’ 15 centuries back, their societies, culture and methods of worship. From Tulum at the traffic light in section of the Coba Road; turn west (opposite to the beach); it will take just 30 minutes to the ruins; just follow the traffic signs. 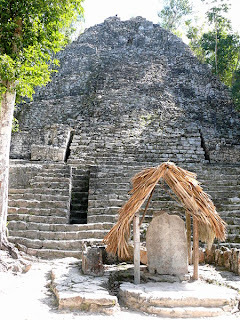 Coba is a calm place and tourists get a leisurely trip while visiting the historical places. Apart from gigantic pyramids, there are smaller sites like cenotes (cenotes are water holes rarely found in hilly areas) and socbes (the roads). These structures are so well planned that it would be hard to believe that they were the works of people who lived here for more than 15 centuries. These are white limestone laid roads typical to the Mayan civilization. Sacbes in Mayan means white road. These sacbes are centered in Coba and from there they stretch to various monuments, and to the Caribbean Sea. They adopted intensive cultivation with irrigation, compost fertilizing and terracing of hills. They built beautiful palaces, tall temples, their ceramics and arts expressed their original style. They had used digit zero and calculated a year with 365 days. Their skills in astronomy could predict solar eclipses. The site of Coba got the name from Lake Coba that lies close to it; the word Coba means ruffled waters describing the lake. Tulum and Coba are two sites which have remnants of the lost Mayan Civilization that flourished in Quintana Roo in Yucatan Peninsula of Mexico. Coba is about 90 km from Chichen Itza and 40 km from the Caribbean Sea. 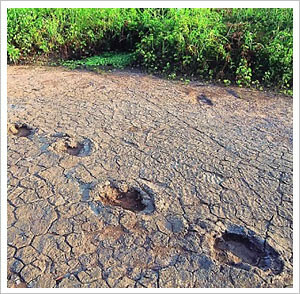 Both are extremely ancient and identical sites located in a distance of 44 km in between. 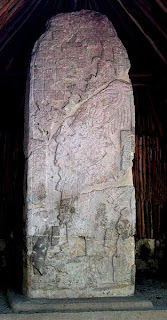 The Coba site is at Quintana Roo in the Thick jungles. The path that leads to the Coba site is forested with abundance of wild life like spider-monkeys, vultures, squirrels, lizards, scarlet-macaw, toucans (toucans are tropical American birds with enormous beaks and bright plumage) and even jaguars. This site was opened to the public only in 1973; only few of the 6000 structures have been cleared so far. The remaining structures are still lying covered by the thick forests for the last several centuries. The whole Coba site spreads to about 60 sq km, only in 1920 exploration works started here because of the remoteness of the site. 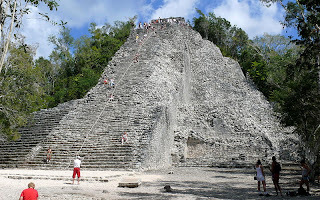 The Castillo of Coba is at the center of the whole site of ruins which spread to an area of 1500 sq feet. It is a step pyramid looking like a steep cliff with a height of 78 feet built with nine terraces. This pyramid has been described as a light house and probable it would have served to carry lantern at that times. This pyramid has vaulted rooms that are supported by feathered serpents which support its roof with their tails where as their heads are held low to the floor. Stairways are provided up to the seventh floor from there a wall stands that supports the base of a small temple that is built at the top of the pyramid. The temple has only a single door. There is one temple north to the Castillo it is for worshipping the ‘God of the Winds’. It is said that this temple is so designed that it will blow warning whistle when hurricanes come (the last hurricane said to have made the temple blow whistle). It is the first object that appears before the visitor is the 65 feet tall structure that is too steep. In height it is the second tallest pyramid in the site. It is believed that this structure was used for community ceremonies. No Mayan Sites is complete without a Ball Court with iron hoops like that of basket ball court, these were said to be places of fun often spilled blood; the captain of the losing team (in some instances the entire team that lost the game!) would be hanged on the hoop. The Nohoch Mul is another pyramid at about 1 km northeast to it by name the Castillo; it is 78 feet high and stands between 180 sq feet of ruins. It is a classic case of Mayan architecture and resembles that of Tikal at Guatemala (the 200 feet tall five pyramids of Tikal at Peten; this place was considered as the capital of the Mayan Empire). Climbing is possible through the loose stone blocks stacked one over the other as there are no stable hand rails (only a rope is placed vertical descent can be done by catching the rope! Descend is risky and tiresome. One wrong step may speed up your descend to the bottom. The Mayan Ruins at Coba lies between two lakes Lake Macanxoc and Lake Coba in Quintana Roo territory of Yucatan Peninsula. They are fairly large water bodies surrounded by lush forests. These lakes and its surroundings are that home to exotic types of birds like macaws. Lake Coba is smaller than Lake Macanxoc. The most ancient culture (2300 BC) of this region is that of Olmec which was the source of the cultures (including the Mayan) those emerged later. The Olmecs were experts in rock carving; large human heads (known as Tolmec Heads) they carved on sandstones lie still intact in these sites. The Teotihuacan that followed the Olmec gave birth to be the largest city of the whole continent by 600 AD; but far before that the empire show signs of crumbling. A D 10 to 12 were marked by the dominance of Toltec race that came from the northern deserts to fill the gap arose by the fall of the Teotihuacan. 13th century AD belonged to the Aztecs who were battle hardened vagabonds of the deserts who came to power and established an empire in the speed of a lightening. The Mayan culture is very much influenced by all these empires and cultures stated above. They had only hieroglyph and inscriptions on rocks and Stele (Upright stone or slabs with inscriptions or relief design). It is from these vague signs archaeologists work their way to trace events that has occurred 15 centuries back. In the first century Coba was a city with a population of 50,000 people. Most of construction is believed to have happened between 500 to 1000 A D. The main occupation remained agriculture but maritime and land routes converged there made it a trade point. Maya cities acted like independent states in all aspects, they made mutual alliances, fought each other, traded goods across boundaries, their sacbes crossed the forests here and there. Markets were filled with maize, beans avocados (a pear-shaped fruit with smooth flesh) etc. Archaeologists have done further researches to study the style of life those people led and about their level of literacy etc. As per evidences it has been established that the noble men, priests and people with influence of Mayan society lived in high walled ramparts lived in comfort or were engaged in doing researches in mathematics, astronomy and theological wisdom. Kuhul ajaw (holy lords) mediated people with gods, they directly drew power from the gods, conducted elaborate rituals to please gods. Of all the kings who ruled the Mayans ‘Fire is Born’ remains as a superstar. He came from the Teotihuacan and easily conquered the ever warring city dynasties, he destroyed all that belonged to the other warlords and installed stele, united the Mayans in to one kingdom. His goggles, javelins, enormous headgear, and trappings became typical to the Mayans. He established stele all over his kingdom in typical glyph that could be deciphered by archaeologists only recently. Migrants from Spain spilled all over and there were battles between the tribes and the migrants, the peace loving people who lived on agriculture could not win the battles with their old and crude weapons. Those who surrendered to the migrants were subjected to inhuman exploitation and these people got reduced to mere vagabonds in their own land. While all these were going on the missionaries were engaged in a conversion spree. First they lost their land; then their pride; their loss was complete with conversions, what remained with them as their soul also parted ways. These unfortunate tribals; the Mayans became mere ghosts and what all these ruins have to tell are all mere ghost stories! Hong Kong the synonym for free trade has always remained as a glaring example for the advantage capitalism over controlled economy. Its sky scrappers stand tall as show case examples of the power of capital and entrepreneurship. With the expiry of the 99 years’ lease agreement between Britain and China on 1997; Hong Kong was returned back to China. China has agreed to keep it as a Special Administrative Region under the Hong Kong Basic Law for one country two systems. This law ensures that Hong Kong will operate with high degree of autonomy; and will be in force till 2047 under the policy of ‘one country two systems’. Hong Kong has a hilly terrain with a coastline of 733 km, its mountains are steep and the highest peak is Tai Moshan which is 3143 feet (958 meters) high. Hong Kong is bordered by the South China Sea, Deep Bay and the Mirs Bay. People’s Republic of China has two Special Administrative Regions (SAR) Hong Kong and Macau. The SAR of Hong Kong includes 1 the New Territories (attached to the mainland, 2 Kowloon (a peninsula of the mainland 3 Hong Kong (island) and the 4th Lantau (the largest island of the group). 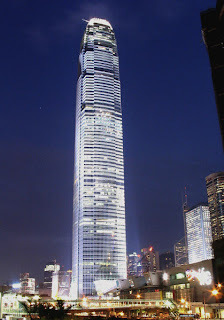 Hong Kong is located in the delta of River Pearl at the southeastern coast of China facing the South China Sea. It is a group of about 236 islands among which Lantau and Hong Kong are number one and two in size. Hong Kong has the largest population but one island of the group -the Ap Lei Chau - is the world’s most densely populated island in the world. 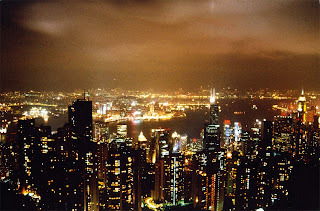 The Kowloon Peninsula and New Territories are also part of the Special Administrative Region of Hong Kong. China retains defense and foreign policy while Hong Kong has legal system, policing, monetary system, immigration, customs policies, sending of delegates to foreign lands etc. For the convenience of administration Hong Kong is divided in to 18 districts, it is a free port since 1910 and a hub of maritime trade; it has a population of 7million in an area of 1104 sq km. With a density of 6352 people per sq km it is one of the most densely populated places in the world. The GDP of Hong Kong is US $ 289 billion and the per capita income is around US $ 29,200; its currency is H K $. To understand the prominence of Hong Kong it would be helpful to see the number of foreign consulates located here; it has 107 consulates while New York has only 93! 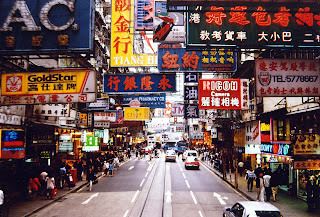 Cantonese-Chinese and English are the main languages spoken. Hong Kong was first incorporated in to the nation of China by the Qin Dynasty while the Tang Dynasty that followed them used its potential as a trading point. The earliest European to visit Hong Kong was Jorge Alvares a Portuguese in 1513; while the British poked there head through The British East India Company that established a trading post here. When Chinese Emperor of Qin Dynasty refused to import opium it led to two wars between China and the British (the Opium Wars). British who won the battle gained custody of Hong Kong and it was made the Crown Colony under the British. In the native language the word ‘hongkong’ means a ‘fragrant port’, the British who acquired Lantau and Kowloon defeating the Chinese Empire were smart enough to gain a 99 year lease agreement of the whole region. They expanded the old and dilapidated harbor and to tap its full potential of the location. The Victoria Harbor they built is one of the deepest natural ports in the world; is located between Kowloon Peninsula and Hong Kong. The British had to pay heavy price for its custody during the World War as they had to face relentless Japanese attacks. The Japanese at one time (1941) defeated them and caught many British and Canadian army and POWs (a la Bridge on the River Kwai story). On December 8, 1941 Hong Kong had a tryst with the Japanese; they invaded Hong Kong and the occupying British and Canadian forces were forced to surrender leaving Hong Kong at the mercy of the Japanese. The misdeeds they have done in Hong Kong is unparalleled in the history of the world. They cut of food supply forcefully took away whatever currency left with the people and gave military notes in exchange. People with no money to buy food (even with money nothing was available) died due to starvation and diseases; more than half of the HK’s population perished within this five year term tells the enormity of that disastrous rule! This misrule lasted until the end of the Japanese Empire in 1945. Later after the fall of Japan; UK forces took Hong Kong back and normalcy was reestablished. When China came under the Communist regime and the ensuing civil wars many people had to flee from mainland. China got rid of some of the elements they thought ‘unfit’ for their ‘radical revolution’. Along with ordinary people who migrated; many business people and establishments got transplanted to HK giving an impetus to its march to progress as one of the business centers of the world. One man’s (nation’s) poison turned out to be another nation’s meat! Sun Yat-sen Museum located in Kom Tong Hall at 7 Castle Road was opened for public in Dec 12, 2006 to commemorate the 140th birth day of this great statesman who always had a soft corner for Hong Kong. This is the most popular Buddhist temple in H K there are two deities here to be worshipped Man Cheung and Kwan Yu. Man Cheung the God of literature who had had 98 incarnations and finally got deified in 1314. The Kwan Yu was a native of Shandong Province and was a General under Han Dynasty later go deified after his death about 2000 years back. Kwan Yu has been accepted as the Patron Saint of various professions. It is a mega entertainment park in Wong Chuk Hang and Nam Long Shan; it is a 214 acre estate with 14 rides, 2 roller coasters and one water ride. It has been ranked as 7th to amusement parks by the Forbes Magazine. The number of visitors exceeds five million a year. It is not just an amusement park as there are laboratories, observatories and education facilities. Its aquarium houses more than 2000 fish varieties. Most luxurious beach; formerly this bay was a haven of sea pirates who were repulsed by British and hence the name. This is the most expensive area of H K as one sq foot of land can fetch more than 20,000 H K $! This museum heralding the brave history of the British forces who repulsed several attacks by the Japanese Empire is located in Lei Yue Mun in Hong Kong. Here military castles, equipments, vehicles, guns etc are displayed. It has a total area of 34,200 sq meters and tells the story of 600 years of coastal defense. Stanley is a peninsula in the southern point of Hong Kong; it is said that the local name chik chue was originated from a notorious sea pirate who operated from this bay. It is a major tourist attraction famous for clothes available for bargain prices. This place has much historical importance as the last point where the British and Canadian forces stood before they were forced to surrender before the Japanese. Now this fort is occupied by the People’s Liberation Army of China. It is located near Po Lin Monastery at Ngong Ping in Lantau Island. This statue is the tallest bronze built out-door seated Buddha statue in the world. Tian Tan Buddha is a major pilgrimage center for Hong Kong Buddhists as well as a major tourist attraction. There are many other places of interest in Hong Kong like the Disney’s Land, Jumbo Kingdom, Temple Street and Hong Kong Cultural Center etc. Hong Kong is not only famous for its historic locations but its shopping malls are so bewitching that they may turn an ordinary sight seer in to chronic shopper. As a duty free port, much of the tourists electronic, fashions dresses and white goods are not just economical in prices but they come with very many varieties as no where else in the world can boast of. Hence hurry, the party lasts only up to 2047 after that; will China toe the Hong Kong line or vice versa? Let us wait and see! Beijing in Chinese means Northern Capital and it has been the capital from as early as 1st millennium BC. When the Warring States were prevalent in the region Beijing was the capital of one of them. Warring States are areas controlled by local chieftains who at times obeyed the king and at times paused as king but always fought each other. The present Beijing is a sprawling metropolis, second largest in China after Shanghai and is the seat of political, educational and cultural activities of China -the most populous nation in the world. Beijing is a municipality of the People’s Republic of China where a municipality stands for a province or a state. The municipality of Beijing has been further subdivided in to 18 subdivisions by name counties for the convenience of administration. A city of numerous names! Beijing was formerly known as Peking, there isn’t anything uncommon for Beijing to be known in different names rather it has been the norm for this city since long. In its long history as the capital of various dynasties; it had been known in numerous names like Zhangdu during Jin Dynasty, Dadu during Yuan, Khanbaliq during Mongol period, there are several other names like Cambuluc, Shuntian etc. Yanjing was yet another name in which the city was known; the Yanjing now prevails as the name of a local brand of beer! All these names may make Beijing eligible for an entry in to the Guinness Book of World Records as a city known in most names! Beijing is the no. 2 metropolis in the People’s Republic of China in size where as Shanghai and Hong Kong are more prominent in commerce and business. The metropolis of Beijing is capital to the Municipality by name Beijing. The Beijing Municipality has an area of 16,801 sq km (29th) is one of the largest in the world, its population is 17 million (26th) of which about 8.5 million are urban; the density of population is 1037 per sq km. It is also a point where the road and railways to all directions meet giving it a strategic importance. When it was initially constituted the Beijing Municipality consisted only of the urban and immediate surroundings coming within the Second Ring Road. Later several counties were added to it and Beijing reached in its present size; for this the ancient Beijing City Wall had to be demolished. The economic reforms introduced by Deng Xiaoping has made the Chinese economy boom and the rural areas surrounding Beijing saw an influx of population necessitating construction of a third ring-road and another the 4th followed by the 5th ring-road. All these were inadequate to provide facilities to the booming population of the ever growing city. At present the government is constructing a 6th ring road; that is the pace of growth of this nation known as the Asian Dragon! The ruling Communist regime is particular to see that this city remain as a show case example of the modern resurgent China; hence slums and other unpleasant objects got cleansed from the city limits; giving Beijing a fresh and modern look. Beijing as it is getting braced for the 2008 Olympics has much to offer for a tourist; its latest constructions are capable to marvel the most modern ones seen anywhere else in the world. The numerous historical locations lying scattered in the city is far more ancient and reveal the rich history the city has to offer. 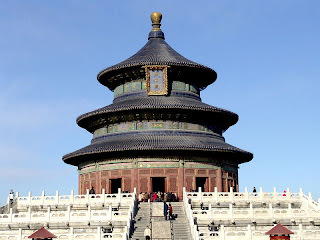 It is one of the magnificent spectacles Beijing has to offer; it had served as residence for the Mid Ming Dynasty to the end of Qing Dynasty; almost 500 years. This gigantic palace was built in 1406 and it has 980 surviving buildings; it is a UNESCO recognized World Heritage Site. Total built up area of this palace is 720,000 sq meters and it has 8707 rooms! The Tiantan is the Imperial Sacrificial Altar of the Taoist Sect located in the southeast urban Beijing. This was built in 1406 and is one of the most outstanding structures that stand tall as fresh as the time of its make. 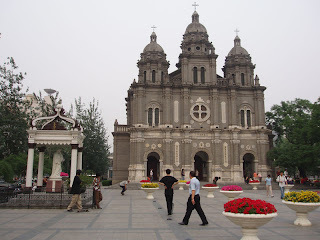 This temple was visited by the Ming and Qing Dynasties offering prayers for good harvest. It is located in Haidian District Beijing; built in 1733 by the Qin Dynasty; it was the place for the emperor and his family to pray. Its initial name was Jueshong Si; when the bell was later brought in the temple got the name –The Great Bell Temple. The bell is 46.5 tons in weight and it is 6.94 meters in height; inscription chanting Buddhist prayers are visible on the bell. The Pagoda of Tianning Temple in Guang'anmen of Beijing, built in 1120 during the Liao Dynasty. Means Garden of Perfection or Garden of Brightness; it was built in 1723 by the Qin Dynasty; located in the north western outskirts of Beijing. The construction was so elaborate that it took about 150 years to complete. It had three rows palaces on its southern part. Located in Zhangye Gansu Province it is a wooden nine storied structure with 32.8 meter height. 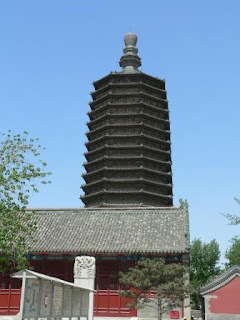 This wooden pagoda was built in 557 AD by Northern Zhou Dynasty; renovated several times at present well preserved. The oldest and the largest mosque in Beijing located in the Xuanwu District Beijing; it is the spiritual center of the thousands of Muslims of Beijing. 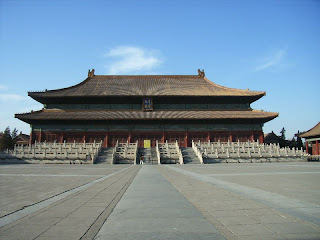 It was built in 996 during the Liao Dynasty and reconstructed during 1622 – 1722. 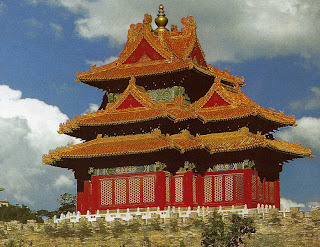 For a tourist there are several locations other than what was mentioned above some of them may be mentioned below; Bell and Drum Towers, Beihai Park, Temple of Recumbent Buddha, Summa Palace, The Ancient Observatory, White Dragobe Temple, Summer Palace, Temple of Azure Clouds etc. The Great Wall of China one of the most acclaimed World Wonder is also nearby. An article on Beijing is not complete without mentioning ‘Unit 731’ or ‘Nana san ichi butai’. When Japanese army took control of Beijing (during 1937 -45); they established this research lab-in the disguise of a water purification plant. In this lab they conducted research for developing biological weapons and weapons for mass destruction. It was live human beings on which they did experimentation. The victims included Chinese, Russians, Koreans and Mongols. The death toll of the researches were more than 10,000 human lives, while the biological weapons for mass destruction experiments they conducted took away more than 200,000 Chinese lives! It was in Tiananmen Square in October 31, 1949 Chairman Mao Zedong announced the creation of the People’s Republic of China; later all important events of that nation was held in that square; which is also famous as the largest square in the world. It all started in 15th April, 1989 when laborers, students and intellectuals of China assembled in Tiananmen Square to voice their protests against various issues, students wanted parliamentary system introduced, while laborers wanted better wages and working conditions; where as intellectuals wanted freedom of speech and human rights. They had no common leader, no common agenda; all hated the ‘rotten government’ and wanted it to go! The Chinese government was not used to democratic protests and their reaction was as military as they themselves were! Few would have forgotten that lone young man who was standing bravely facing the army of battle tanks that rumbled to the square; we can only presume what happened to him. It was the same fate that was faced by thousands of protestors assembled there. Summer is the peak tourist season in Beijing for a scrupulous visitor this season is better avoided as hotel charges are sky-high, and the crowds, dust and pollution make everything a mess. Tiangao Qishuang (literally mean high sky and fresh air); the autumn is ideal for visitors when there will less crowd and hotel rates will be reasonable. The winter is good if ready to withstand the freezing cold; substantial discounts at the hotels and extreme privacy. This year’s winter was a bit extreme as whole China froze and the visitors also would have plunged in to the frozen Chinese soup! What about next year’s winter? If prepared to take risk book for next years winter and go on praying “god please save this miser and make next Chinese winter bearable”! Stock answers to quiz; that also is in Brazil, the Caatinga! A quiz master asks 10 questions of the first 7 are in the following order the contestant would be a lucky one simply answer Brazil, Brazil seven times; the candidate scores 70% marks even the rest 3 are wrong! 7 Biggest of thorn forests - The Caatinga Thorn Forest, Brazil! The word caatinga in the Tupi (an ancient trine in the region and their language) means white forest (kaa = forest + tinga = white). The reason for this name is that during summer the green color vanishes along with the fallen leaves and the whole area appears grayish white the color of the ground. The Caatinga scrub forest located in the northeastern part of Brazil lacks a well marked boundary with its neighboring areas; It is bounded by the Atlantic dry forests in the in its west, Cerrado Savannah in the southwest, and the long humid Atlantic Forests in its west coast. The Caatinga is a vast ecological entity in the northeast part of Brazil with an area one million sq kms and that encompasses eight states of that big nation. It also has the status of being the largest scrub forest in the world with very rich biodiversity. For botanists it is a hetero-genus location as the flora fauna belong to different ecological entities. 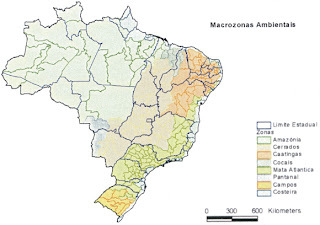 Its borders with Cerrado, Atlantic Forests, and Amazon have allowed considerable interchanges of the flora and fauna with these neighboring regions. The tall forests are mainly confined to four places they are Chapada do Aroripe, Serra do Ibiapaba, Serra de Baturite and Serra da Borborema. Geographically speaking the Caatinga region are crystalline sedimentary depressions with broken continuity as isolated plateaus criss-cross to forma a vast mosaic. Piaui, Ceara, Rio Grande do Norte, Paraiba, Pernambuco, Alagoas, Sergipe, Bahia and Minas Gerais are the eight states of Brazil that together share this vast thorn forest. Only two seasons both hot! 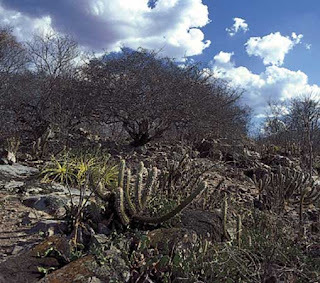 Caatinga has only two seasons a dry, prolonged and hot winter followed by a short spell or rainy season that may last anywhere between 1 or 4 months; the strange thing with this rainy season is; it also is equally hot! The Caatinga is located at the northeastern part of Brazil it forms about 10% of the total area of Brazil. Caatinga receives only about 25 to 100 cm rainfall annually; a rainy season lasts between 1 to 4 months; even during rainy season it is not cool at Caatinga; but that makes the shrubs wear a green coat of fresh leaves, grass seeds sprout, the dried up river starts to flow and the whole area buzz with busy beings. The Caatinga is an endless sea of bare earth and thorny shrubs with small patches of forests with large trees here and there. These plants are well adapted to face the long and hard dry season. The plants here shed their entire leaves during hot season and stand naked to face the dry season; the lack of leaves reduce loss of water due to evaporation. With the shed leaves they look like dry and thorny twigs. These thorns and spines are actually reduced stems and leaves. While grass varieties that live only during rainy season vanish altogether with the end of that season. They sprout, grow, produce flowers and disperse seeds during this short time and perish after the completion of their mission; leaving the space empty. Some of the plants let their modified roots protrude above the soil; these roots are capable to absorb moisture even from the arid air of Caatinga! 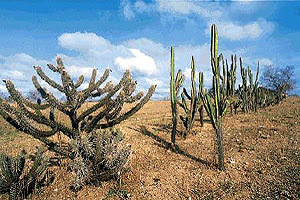 During the peak of summer the ground soil of Caatinga reaches up to 60 degree centigrade yet plants like cacti (succulent stemmed plants with sharp spines) and horny bush plants survive; succulent plants have stems capable to store food and water enough to tide over the prolonged dry season; they alone look green in the sea of grey. Not 1, but 10 Caatingas! The entire area of Caatinga is not a homogenous eco region as it is generally thought; there are islands of cool forests here and there; which the call Tall Caatinga. Scientists who do research on the geography and ecology of this region have identified about 10 geographically and climatically defined subgroups in Caatinga (with their flora and fauna varieng accordingly). As per these scientists; these ten subgroups can be broadly arranged in six main groups. It starts from areas with less than one meter plants (shrubby Caatinga) with shallow sandy soils to tall forests with 25 to 30 meter high trees (Tall Caatinga Forests) with Eutrophic soils. There are about 1200 species of vascular (developed plant varieties) plants in Caatinga making it a biologically rich location; about 30% of these are endemic (exclusive to the region). There are about 185 species of fish, 44 lizards, 49 amphibians, 47 snakes, 4 turtles and 3 species of crocodiles; altogether there are about 1000 species that are endemic. It is the variety of the birds (avifauna) in this region that is most significant; they number about 350 species. Some of them like the Indigo Macaw and the Little-blue Macaw are the most threatened ones due to rampant catching and destruction of their habitats. Even Caatinga could not escape the axe of human beings especially the scattered humid areas, where water is available and large trees existed. Those trees are being cut for wood and the land being used for agriculture. The loss of these trees is detrimental to the rare and already endangered birds like macaws that are endemic to Caatinga. Adding insult to injury these birds are widely captured to be sold in the black market. The role of the Brazilian government machinery does not seem to be active enough to stem the tide. Grazing of cattle and conversion of forest land to agriculture and even industrial purpose etc go on as usual. While the officials never realize the fact; once destroyed this delicate system can never be restored; however efforts put in to it. 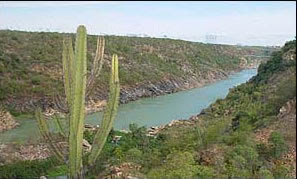 Only one percent of the Caatinga biota is placed under protection thereby giving way to rampant commercial exploitation of the rest. It will be shocking to hear that 50% of the Caatinga is in the threat of human interference and 90% of these forest patches have already vanished before human axe, the process is still continuing. A park with a task! There is a national park entrusted with the upkeep of this bio system (Parque Nacional do Serra Capivera) which is one of the best managed one in Brazil; it is hoped that this institution act as a candle-light in the darkness that encircles the Caatinga Biota.